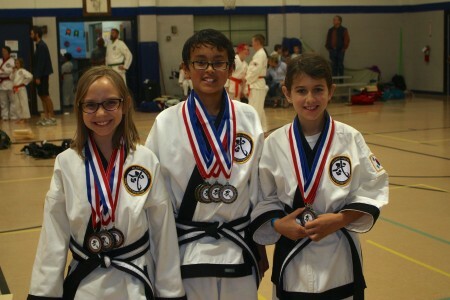 The weekend began with the Regional Dan Shim Sa on Friday evening. There were many participants on the floor, both testing and reviewing, and nearly every school was presented during the exam. The physical exam was demanding, and the participants were challenged on the variety and efficacy of their techniques, to the admiration of the large audience in attendance. Pushing through the rigors of the examination, the participants of the exam showed tremendous courage, perseverance, and martial spirit, and all participants finished the examination with distinction. Best-of-test awards were presented with final words from Kwan Jang Nim St. James as well as Sunim Sabom Nim Farquharson. The adult winner of the Best-of-Test award was Mr. Benjamin Roe, of Abilene Karate Academy, and the child winner of the Best-of-Test award was Mr. Anthony Kardeen, of Thunderbird Martial Arts Academy. 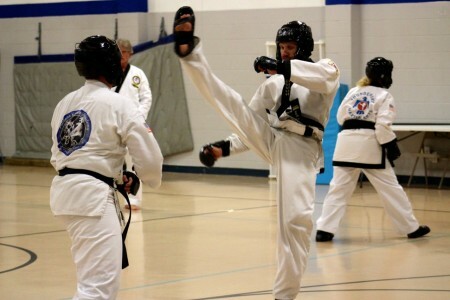 Saturday, participants competed in open-hand forms, weapons forms, sparring, and breaking. The competition began with the Black Belt divisions, much to the excitement of observers. While the black belts were competing gups (color belts) were checking in, warming up for their events, and watching the black belt competition. Once black belt competition completed, Kwan Jang Nim St. James convened the opening ceremonies. All students lined up by belt rank, stood at attention for the playing of the national anthem, and bowed their heads for the invocation. The championship floor consisted of five competition rings. Competitors from age 3 on up competed in the various age divisions as family and friends watched and encouraged all competitors. When students were not competing, they found time for a drink of water or a quick snack, cheer on their fellow students, or hold boards. Kwan Jang Nim St. James was particularly involved during the event, as he toured various competition rings, provided assistance to the center judges, and encouraged competitors throughout the day. All in attendance were enthusiastic and appreciative of the Kwan Jang Nim’s efforts. Competitors also had time to catch up with friends from previous Federation events or make new friends. All competitors gave their all and ended the tournament proud of their efforts, regardless of whether they medaled or not. Following the main competition, there was a brief rest period which was followed by a special set of seminars hosted by Sunim Sabom Nim Farquharson and Kwan Jang Nim St. James. Sunim Sabom Nim Farquharson drilled students on sword technique, while Kwan Jang Nim St. James incorporated empty-hand techniques and bong (staff) techniques into his lessons. The many attendees who participated in these special seminars were immensely appreciative of the special instruction they received from the esteemed Master instructors, and knew it was well-worth their time. Saturday evening was the final, official event of the weekend, being the traditional Championship Dinner. The Championship Dinner was hosted at an Italian restaurant, Mario’s, and was extremely well-attended. Students from every member school in attendance for the championship were present for the Championship Dinner, and many new friendships were forged in the atmosphere of good food and camaraderie. It was noted that a special effort was made by Kwan Jang Nim to journey the restaurant and meet with students and their families during the meal, including taking photographs with some of the students. All were appreciative of the family atmosphere the APTSDF always brings to their events, and students and their families are anxious for the next, great event in the Southwest Region.